WASHINGTON (Reuters) - U.S. Vice President Mike Pence is set to announce "concrete steps" and "clear actions" to address the Venezuela crisis when he meets on Monday with regional leaders in Bogota, Colombia, a senior U.S. administration official said. 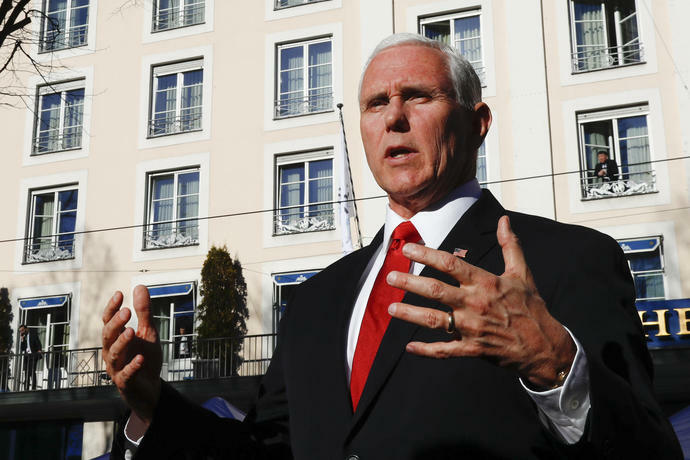 The official declined to comment on what the new measures would entail ahead of Pence's speech, to be delivered to a summit of the Lima Group around 10:30 a.m. EST (1530 GMT) after he meets with Venezuelan opposition leader Juan Guaido. The meeting come after convoys of U.S. aid were blocked at the Venezuelan border by forces and gangs loyal to President Nicolas Maduro. The United States and most other Western nations no longer recognize Maduro as the country's leader. "The vice president will announce concrete steps," the official said. "You should expect him to announce clear actions tomorrow as he speaks to the Lima Group." U.S. President Donald Trump and other Western leaders have recognized Guaido, the head of Venezuela's national assembly, as the country's interim president. The official said Washington want to find ways to empower him. In recent weeks, Trump has said all options were on the table for supporting Guaido, and has declined to rule out the use of military force. Asked by reporters whether the United States would provide military force if requested by Guaido, the official said that Pence would listen to his suggestions and take them back to Trump. "Ultimately, it would be a decision for the president to make," the official told reporters. On Friday, another senior U.S. official told reporters that Pence would be prepared to announce new sanctions at the Bogota meeting if the aid convoy was met with violence.